Why are you reading this? You know what I’m going to say. I’m going to say the same things everyone else has already said. What you should be doing is buying this game, and playing it right now! Seriously! Stop what you’re doing, go onto the Wii U eShop, and buy this game if you haven’t already! Go! Go go go!! …Are you still here!? Ugh. Fine. 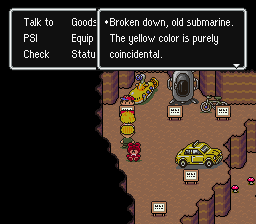 I guess I’m going to have to explain why EarthBound is one of- if not the– most amazing, RPGs ever made. Because that hasn’t been done to death already. EarthBound is the cult game to end all cult games. Before Psychonauts became the poster child for critically-acclaimed commercial failures, EarthBound was capturing the hearts and minds of the few people who actually bought it for the SNES (shame on you if you never bought it when it was first released). After many years of Mother fans begging Nintendo of America to do something with the franchise, and Nintendo of America neglecting said fanbase, EarthBound has finally, finally been released on the Virtual Console for a whole new generation to experience and enjoy it. 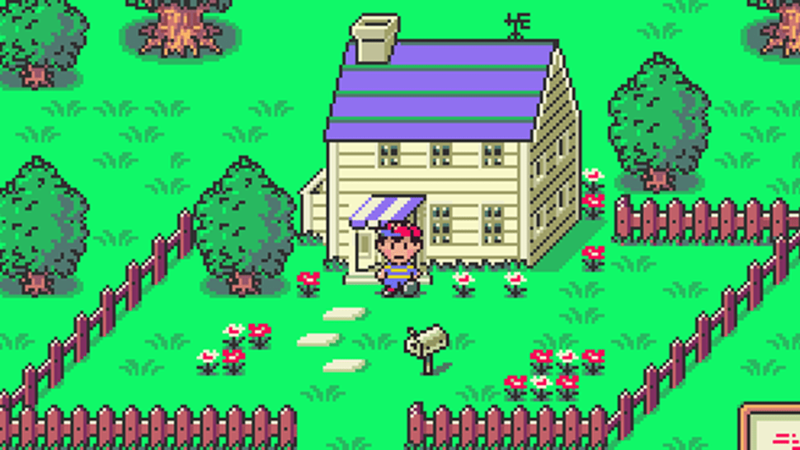 You play as Ness, a young boy with psychic powers, living in Onett with his mom, sister and dog. You find yourself awoken when a meteor crashes near your hometown. Having gone to investigate, you find a bee-like creature named Buzz Buzz who comes from 10 years in the future. He tells you of a horrific future in which the world is destroyed by an alien entity called Giygas, and only you and three other chosen kids have the power to stop him. You must collect eight melodies scattered across the world, and use them to defeat Giygas. Along the way, you must meet up with the three other chosen kids. They are Paula, Jeff, and Poo (no really, that’s his name). …That’s assuming you don’t abuse the naming function. Not only can you name all of your party members, but you can name your pet dog, your favorite food and even your favorite thing, which becomes your signature attack. 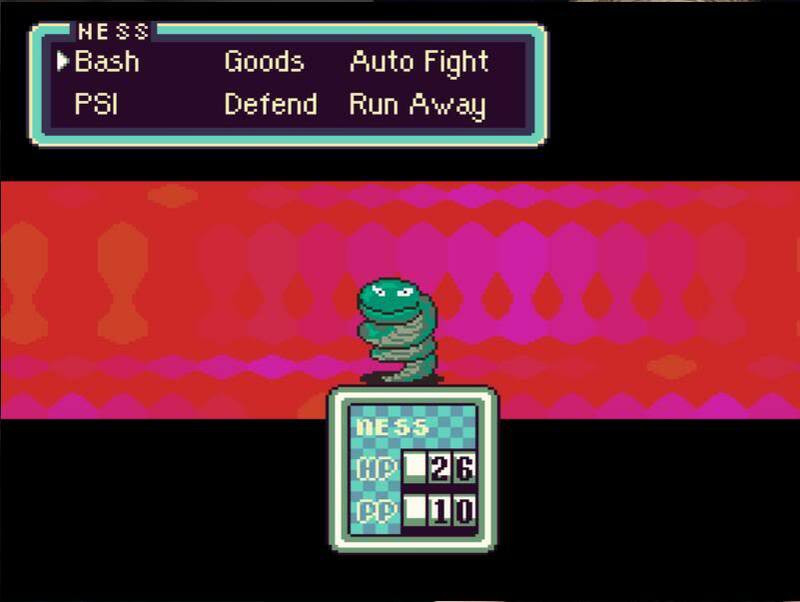 Ness’ signature attack is called PSI Rockin on the few occasions when I’m mature enough not to abuse a naming system like this and PSI Farts at all other times. It’s a shame that you can’t give your next-door neighbor, Pokey Minch, a custom name. Without spoiling anything, I could think of several names for this particular character by the end of the game. The game takes place all over the world, including the US…er, I mean Eagleland. The place you start in is a tribute/parody of the US from a Japanese perspective. This is a very different setting than most other JRPGs, which take place in either medieval fantasy, sci-fi, or Japan. Even today, you don’t see very many JRPGs that take place in a modern-day American setting, let alone one that has hamburgers instead of potions, and frying pans instead of swords. The battle system for this RPG is definitely worth mentioning because it does a lot of things right. First off, there are no random encounters in the game since all enemies are on the overworld map, not unlike Chrono Trigger. It also has an auto-attack option, which puts the battle on auto-pilot for battles that would be too much of a bother to carry out manually. When a party member gets hit by an attack, their HP gradually decreases over the course of the battle instead of all at once, like in other RPGs. This gives you the chance to use a health item or a healing PSI move before the attack’s damage is fully realized. This kind of mechanic becomes especially useful during battles against particularly nasty opponents to help prevent your party members from getting knocked out. Another really interesting feature that goes out of its way to be a convenience to you in regards to battles is how the enemies behave on the overworld map. If you’re at a high-enough level, some enemy encounters will be skipped altogether, and give you an automatic win. If you’ve beaten a boss in a particular area, enemies will actually run away from you if you get close to them. This mechanic makes backtracking and XP grinding much less of a hassle than in other RPGs. This is a feature I’ve never seen in any other RPG I’ve played, too. The fact that this idea hadn’t been adopted in other games is really surprising. 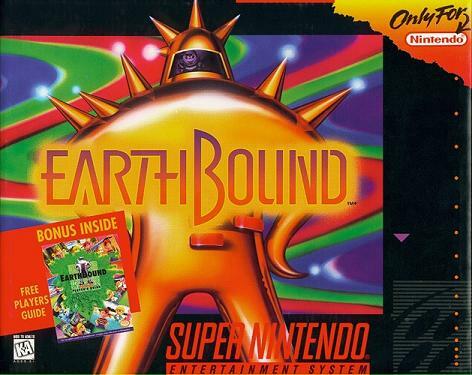 Over the last few years, rumors sprung up about Nintendo of America refusing to release EarthBound because various aspects of the game contained references to music and other various bits of pop culture, particularly with the soundtrack. Thankfully, everything that people loved about the original EarthBound has remained intact in this release. The weapon names are the same, the pop-culture references are still straight out of the late 80s/early 90s, and the music is consistent with its original release. Yes, but can you live in it? 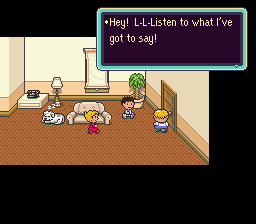 The music in EarthBound is especially worth noting here, and I’m not saying that simply because I’m a music major. Yes, there are a number of tracks in the game that take more than a little inspiration from more popular songs at the time (particularly the track played during the character naming screens and the beginning of the hotel wake-up theme), but most of the soundtrack contains original compositions. The kinds of MIDI instruments used here have a bizarre sound at times, with some tracks being distorted or warped. However, I find it helps reinforce the zany, quirky style that the game presents. Besides, there are a number of sweet, heartfelt tracks that are just a joy to listen to. It wouldn’t be a proper review of EarthBound if I didn’t mention the humor. It doesn’t necessarily rely on the same kind of wit that games like Psychonauts, Portal and The Secret of Monkey Island do. It has a degree of self-awareness not unlike the Paper Mario series, and has a fair amount of clever word-play, but EarthBound’s sense of humor tends to lean more towards the quirky and absurd. This can be seen in dialogue with most NPC characters, items like the Ruler, the Protractor and the Suporma which do absolutely nothing, and especially the enemies. 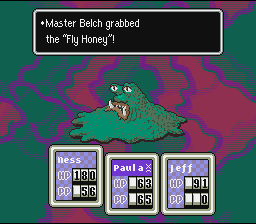 I’m just going to list out of context the kind of enemies you end up fighting in Earthbound: Cranky Ladies, New Age Retro Hippies, sentient street signs called Crazy Signs, a sentient pile of puke called Master Belch and a living tent that appears out of nowhere with no explanation called the Boogey Tent. I wish I could make this stuff up. Any game that has you fighting these kinds of enemies simply cannot be criticized. What other game lets you fight a living pile of puke. …well, okay. There are some nitpicks I have about EarthBound. The graphics are one such nitpick of mine. This may be just an SNES-era game, but, compared to the graphical prowess of games like Chrono Trigger and Super Metroid, they seem pretty unpolished. However, they do have an exaggerated and cartoony look to them which, much like the music, I find helps compliment the game’s bright and quirky style. I didn’t find them to be that much of a problem, but others might feel differently. What I did find to be a bit of a problem were periods when the frame-rate started to slow down, but those were infrequent and short enough that it didn’t seriously get in the way. Also, for those of you who like RPGs with a lot of sidequests, you may be a bit disappointed. EarthBound is by no means a short game, clocking in around 30 or so hours depending on how much grinding you do. However, there are virtually no sidequests in this game. It’s probably one of the more linear RPGs I’ve played. The only two things that can be remotely considered sidequests are scavenger hunts for Magic Truffles and the Kings Equipment (most notably the Sword of Kings), neither of which the game actually tells you about. The only way to know about this would be to use a strategy guide. Thankfully, Nintendo has released the Official EarthBound Strategy Guide on its own, brand new website and have actually optimized it for viewing on the Wii U Gamepad, which is a very nice touch. The flaws I previously described are ultimately minor, and don’t detract much from the amount of enjoyment you can get from EarthBound. At the end of the day, this is quite possibly one of the most heartfelt, endearing RPGs that has ever been made. You would be doing yourself a great disservice if you missed out on this game. If you like RPGs of any kind, or even if you don’t like RPGs at all, you owe it to yourself to check this game out regardless of its few flaws. I guarantee you that you’ll never experience anything else like it…well, at least not until Nintendo decides to give Mother 3 an international re-release. Please don’t fail us again, Nintendo.